In starting phase, search engine optimization was not a big deal; it was just regarded as medium to build more and more back links for a website. To streamline the complete process, Google, one of the commonly used search engine, has given many updates as result SEO is no longer a child’s play or a simple back-end operator’s work. Some of the updates given by Google are Florida, Brandy, Bourbon, Jagger, Buffy, Vince, Caffeine, Panda and Penguin. They made drastic changes in Google algorithm history and have improved the SERPs quality. The search engine has been continuously working on its Panda and Penguin updates and has given out different versions followed by the main updates. These updates have completely changed the SEO process. In February 2011, SEO experts faced a sudden change in the way the rankings of websites were affected. It was because of Panda update, named after Navneet Panda, a Google engineer, that made a remarkable difference in the SERPs. 11.8% search queries were affected from this update. It was also known as “Farmer update”. SEO experts realized that content spamming or content farms sites were majorly affected by this update. It took almost a year for the engineers to actually lay down the rules to overcome the menace of duplicate content. According to SearchEngineLand, “ezinearticles.com lost an average of 34 positions.” So it was a big loss for Ezinearticles. There were so many other websites that also benefited from Panda include Amazon, Ehow, Yahoo Answers, walmart.com, Wikipedia, etc. After this update, Google has been adding different versions to this update at regular intervals. On 11 April 2011, the search engine added Panda 2.0 update and it mainly affected English queries all over the world not only English countries. Every month after the 2nd Panda update, Google refreshed it and continued to add on minor changes from Panda 2.1 to Panda 2.4 version. On 10 May 2011, Panda 2.1 released with minor changes in it. But on 16 June 2011, Panda 2.2 released with stronger action against the plagiarized content websites. Panda 2.3 was updated on 23 July 2011 to further improve the high quality website rankings. But Panda 2.4 version was a stern step that the search engine took to put a tab on other languages except Chinese, Japanese and Korean all across the globe. It was released on 12 August 2011 and affected 8% search results in all language. Panda 2.5, 2.5.1 and 2.5.2 versions gave out some minor updates from September 28 to October 13, 2011. Panda 2.5 update was mainly focused on improving the rankings of Google owned websites like YouTube, blogger, etc. On 19 October 2011, Panda 3.0 was released to help the websites that got knocked down in spite of original content after the first Panda update. Panda 3.1, Panda 3.2, Panda 3.4 and Panda 3.5 versions were released during the time period of 18 November 2011 to 19 April 2012. These were also small refresh in this update or we can say they just refreshed the data details. Later version of Panda 3 didn’t have any major impacts. But Panda 4.0 update that was released on 20 May 2014 again left the experts in a fix and had a major impact on the online world. This update mainly targeted thin content, duplicate content websites. Like Panda, Penguin also puts a tab on the performance of the websites and gets new versions from time-to-time. In other words, by the time you fix your pages, another algorithm might appear, and make things fall apart again. It is also regarded as a big threat for webmasters and SEO professionals. Google gave out the first penguin update on April 24, 2012 to obliterate the websites from search result that used link-scheme. It was rolled out globally. According to Google webmaster central blog, “the purpose for the Penguin update was to decrease the search engine rankings for websites with poor quality backlink profiles, excessive keyword rich anchor text, over-optimization for a single term; in general websites that attempted to manipulate search results by using link building schemes. Domains with poor quality backlinks included ones coming from the low quality sites, sites that had no relevance to your domain, paid links, excessively rich keyword links or links with over-optimized anchor text.” Penguin affected a whopping 3.1% of English-language queries. Penguin 1.1 version was released on 25 May 2012, Google called it a data refresh, affected less than 0.1% of English queries. Penguin 1.2 version was released on 5 October 2012, affected 0.3% of English queries and 0.4% worldwide. Forum users seemed almost disappointed that Penguin1.2 had a limited impact. Penguin 2.0 version was a new improved version of Penguin; some evidences suggest that Penguin 2.0 targeted websites to different page levels not a complete site on a whole. According to Matt Cutts,“2.3% of English queries will be noticeably impacted by this update.” Penguin 2.0 is quite similar to its previous versions, in that it penalizes websites that have been using suspicious back-linking techniques and black-hat practices. Avoid low quality back links. Try to build natural back links. Don’t use single anchor text. Create mix both do-follow and no-follow back links. Use social media websites for sharing like – Google+,Facebook, twitter, Linkedin. 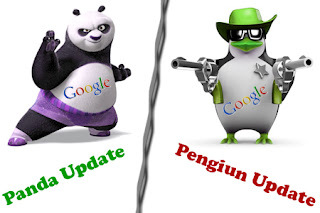 3 Responses to "Effects Of Google Penguin And Google Panda Updates On Your Blog SEO"